Hello there. First of all, I apologize for the ugly quality of these photos; my camera is not cooperating with me since one of my light bulbs died, so there is not much light for it to pick up. Anywho, Monday feels like years ago; that must be because Monday was consumed by one thing–this diy project of turning a dress shirt into a dress. I’m the type of person who likes to think that she’s artsy, but in reality, it’s not her forte. This is a clear example of that; although I’ve been getting a lot of compliments for this diy project, there are quite a few flaws that makes this a practice project. Note to self when making this again next time: 1) As much as I don’t want to admit it, I have a flat chest, so next time, I should cut around 4 inches from the shoulder down instead of 6.5 inches. 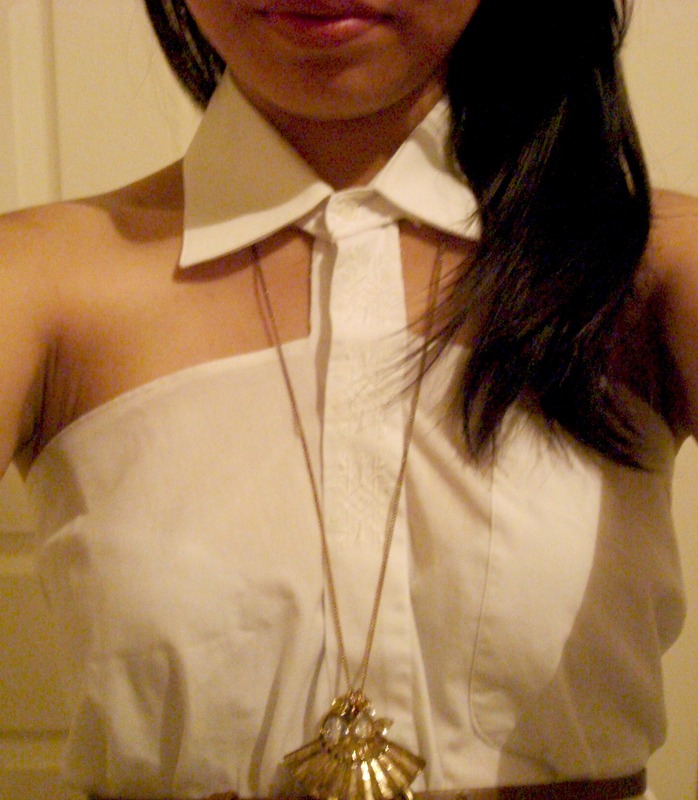 2) Try on the collar part before re-sewing anything. 3) Avoid the sewing machine if possible, but never hand-sew the triangle cuts to create the flare effect ever again…4) GET A LARGER SHIRT BECAUSE THIS PRACTICE VERSION IS WAY TOO SCANDALOUS–so you have been warned. Here’s a close-up photo of the collar detailing if you want to attack this project as well. You know me and my fetish with unconventional cuts, so this style fits right in with my closet. Think of the top part as a halter top, so there is a bare back. After snipping the back, just cut the front, but keep the collar, which ultimately supports the top. Also, it fits in with the collar trend since it’s back in season…or soon to be out of season (which I hope not because I love collars…whatevs, I’ll still rock it :P).